Good news finally Android 9.0 Pie OS is now live for Xiaomi Redmi 5 via custom ROM. 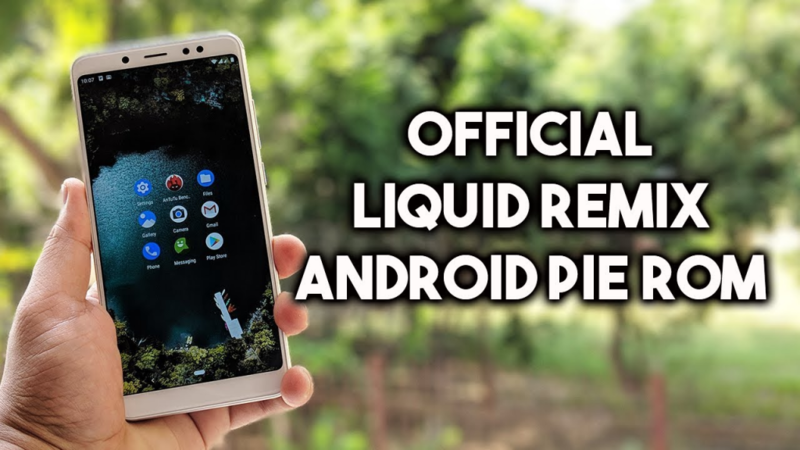 Now you can install Liquid Remix ROM on Xiaomi Redmi 5 which is based on Android 9.0 Pie. The Liquid Remix ROM is an age custom ROM and it is open source custom ROM which is developed by XDA Senior member liquid0624. The Liquid Remix ROM adding many features from all the best ROMs. Recently Liquid Remix ROM build the latest custom firmware which is based on Android 9.0 Pie for Xiaomi Redmi 5. Here in this blog, we share a simple step by step guide on how to install Liquid Remix ROM on Xiaomi Redmi 5 based on Android 9.0 Pie. The Xiaomi has launched Redmi 5 in December 2017 with Android 7.1.1 Nougat and there is no news about official Android Pie update by Xiaomi. So before the official Android Pie stock firmware release until you can install Liquid Remix ROM on Xiaomi Redmi 5 and get the experience of latest Android OS on your own device. Full credit goes to Liquid Remix ROM team which builds and shares this amazing custom ROM. The Liquid Remix ROM comes with all the official features of Android Pie such as Notch Support, Improved Adaptive Brightness, Android Dashboard which Google calls Digital Wellbeing, Redesigned volume slider, Advanced Battery with AI Support and much more. In order to install Liquid Remix ROM on Xiaomi Redmi 5, your device should have unlocked bootloader and should be already installing latest TWRP custom recovery. The Liquid Remix ROM is official stable build which is smoothly run on your device without any problems. We are highly recommended you to keep the backup of important data of your Android Phone before proceeding. If you are interested in installing Liquid Remix ROM on Xiaomi Redmi 5 based on Android 9.0 Pie. Then go ahead and follow the given steps. First of all, back up all the existing data on Xiaomi Redmi 5 like contacts, gallery, SMS, and apps data, then go ahead. Make sure that Xiaomi Redmi 5 has sufficient battery charge before starting the process. Download the Liquid Remix ROM and Gapps zip files from the links above at your PC. Now connect Xiaomi Redmi 5 to PC and copy both the zip files in the home directory of device’s external storage. After copying, unplug and turn off Xiaomi Redmi 5 completely. Now boot Xiaomi Redmi 5 in recovery mode, press and hold “Vol Down+ Power” Buttons for a couple of seconds. At the recovery screen Nandroid Backup, for restore option in case of any mishap. Now Perform Factory Reset, tap Wipe → Advance Wipe → choose “Wipe cache+ Dalvik cache+ System+ Data” > Then Swipe to confirm. Now tap on Install option → Select ROM Zip → do Swipe to confirm. Also, flash Gapps, repeat step7 and then go back to the main recovery. Finally, tap Wipe and do wipe cache and Dalvik cache only, then tap reboot. In results, the process downloads and install Xiaomi Redmi 5 Liquid Remix ROM got successful. Your device is now running Liquid Remix ROM based Android Pie. you can contact us for any question.